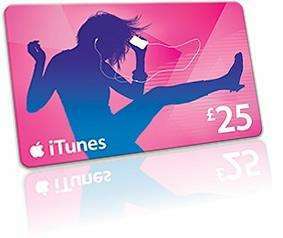 Asda have dropped the price of the £25 iTunes gift voucher to £20, max of 3 per customer. You will receive a confirmation email from Asda Direct within minutes of successful order placement. If you have issues receiving your email, go to the following webpage to access your purchase: asda.virtual-delivery.co.uk . Enter your email address used to order on Asda Direct, your billing Postcode and your Asda Direct Order Number (your order number can be found on your confirmation email from Asda Direct or in your Account Order History on Asda Direct website). When your purchase is complete and you have received your code access email you will have the option to send your code as a GIFT after you login to asda.virtual-delivery.co.uk. *iTunes codes are usually delivered in minutes or, at most within 48 hours depending on additional order validation required by Asda Direct or your credit/debit card company. Thank you very much. I managed to get six for my husband and sons by ordering three lots separately. Also available at Wilkinsons...voted hot as more the 'nerrier'...so to speak at this time of year!!! Also available at Wilkinsons...voted hot as more the 'nerrier'...so to … Also available at Wilkinsons...voted hot as more the 'nerrier'...so to speak at this time of year!!! Don't forget if you have Tesco Clubcard Vouchers you can exchange £12.50 in vouchers for a £25 card. paid £25 for a 25 one yesterday, Brilliant! can you download apps with them or is it just for music videos and movies? Level 2 Dragon horn, get in. Oh and good deal but don't game/HMV do this every year also? Anywhere doing £15 for £10??? Phew, nearly bought one of these in Tesco yesterday as a gift! Do you just get a code from eBay? Mine's for a gift, so a physical card would look nicer, but suppose I could do something presentation wise. Great deal got this yesterday, popped into Morrisons beforehand and asked if they were doing the same deal but customer services said they weren't. Got one of the pictured pink cards from Asda last night. There wasn't any promotion of the deal in store (Milton Keynes), which seems odd. Just ordered online thanks for this! Morrisons aren't doing at the moment but the woman on the counter at entertainment part said they usually only do at weekend and start the deduction on Thursdays as she was looking for some too. Thanks! Just ordered online, and got an order details email already. How quickly does the code come through online, I have ordered one just wondered whether I would get it in time to write in Xmas card. Thanks came through quickly, great offer. I've tried to order this - no luck. They declined saying that it's because I've used an Amex card - which I did - however Amex have confirmed they've taken the money!!! And of course, Asda's call centre is closed for boxing day. If they don't want you using an Amex card, why accept it at checkout. Buyers beware - I bought a couple of these cards from Sainsburys last Christmas (there is no expiry date) and decided to use them the other day. Scratched the protective foil off to read the code, put it in and iTunes said the code was already redeemed! Apple support just fobbed me off - even with video evidence of the second card also coming up already redeemed. There's other posts on the Apple forum also describing the same problem. If you buy, keep the receipts safe somewhere - even if you intend to use them months away from now. Any songs you've bought can be downloaded again! Question, I always pay with credit card in itunes. By buying this, can i just load the credit and use for smaller purchaes? Is the credit going to be used before credit card when i enter my username pswd?